Men and women with a foot odor problem may find that one day their leather shoes have become smelly. Well shoes themselves don’t smell, but the bacteria in the shoes does. It is the bacteria from your body, reproducing and dying in the millions that produce the gas we may call stink foot. Shoes can be washed, with or without water and I will mention some ideas and substances here. 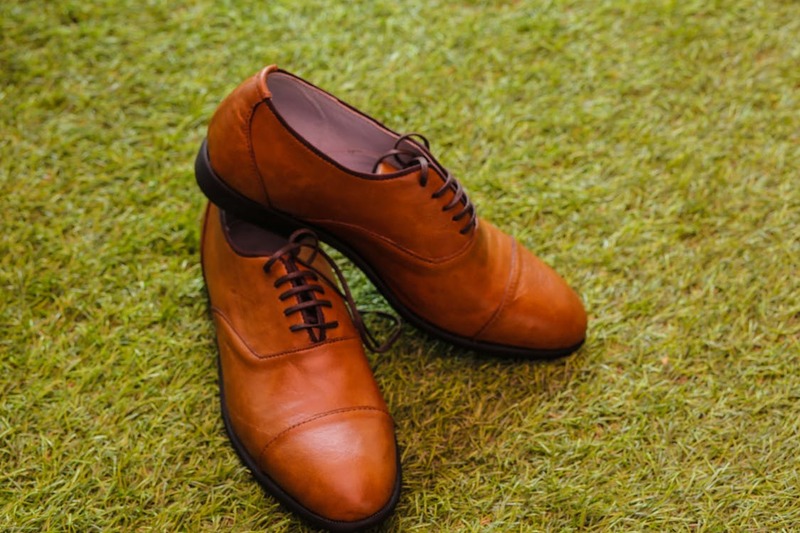 It may be a surprise to learn that most leather shoes can be washed with soap and water and that it does them no harm if they are washed and dried in a certain way. Certain detergents, however should not be used, even if they seem like the obvious choice. Laundry detergent is not good for leather as it removes oils from the leather that need to be replenished and it can also ruin the color of some leathers. Generally mild facial or hand soaps will be better for leather. After all you would never wash your face with Tide. Also, a clothes washing machine or laundry machine is not recommended because it puts the shoes into a car crash boxing match with each other and the machine itself. Heels are for the floor, not the lovely finish of the other shoe. Instead, wash shoes by hand in a bucket to prevent scuffs, glue separation and to agitate spot stains into a lather. Do not be tempted to use hot water because while it certainly removes the dirt and bacteria quicker, it can also compromise the adhesives in the shoes and cause an over-drying of the leather and excessive pigment loss, as well as shrinkage. Some stronger soaps will also over-dry the leather and remove the color of the leather. Mild soap such as castile (olive or laurel oil) soap, some saddle soaps or facial cleansers will wash the leather more gently. If you would not use a certain soap on your face or your hair, then don’t use it on your leather either. Saltwater is good for washing boat shoes, which are designed to be soaked by seawater, but can salt stain dress shoes as it dries. An acne wash will remove the oil from the leather that got there from your sweat glands and is harboring the bacteria that are causing that foot smell. A product such as Clearasil Daily Face Wash is the best way to make the leather inside your shoe bacteria-free, as clean as when new, and it will not damage the leather. Of all the products tried, Clearasil Daily Face Wash is the most effective way to wash leather without harming it. This applies to any type of leather, hard or soft, full-grain or split, and even suede and top-grain Nubuck. Purses, bags, boots, sandals, jackets, dress oxford linings, any fine leather will be cleaned, restored and rendered odor free with this amazing cosmetic toiletry. For stubborn marks on the rubber soles or on parts of the leather, use a brown or blue Scotch-Brite™ scrubber, but never use the green one because it is too abrasive and will scratch away at the leather finish. A Mr Clean Magic Eraser™ is great for white rubber parts. Dry at room temperature, or outdoors in the shade. Do not use a hair dryer or fan heater, but using a room fan is harmless and will speed up the drying a great deal. For example, with boat-shoes, which are always worn without socks, and are designed to get wet, you can wash them frequently, spin them dry in a top loader or towel dry them, and then point a room fan at them and have them back on your feet, spotlessly clean and dry within a couple of hours. The only remaining smell will be that of new leather. To help the shoes keep their shape, you can stuff them with newspaper when they pass from the wet to the still-damp stage, but most shoes washed in cold water never need this. You can moisturize the leather after washing it, either with a leather conditioning cream or with a facial or hand moisturizer. For some leathers a leather oil such as mink oil may restore the original waxy look. Never use a vegetable oil such as olive oil or coconut oil as it can turn rancid over time and also be a food source and safe harbor for the bacteria that is causing all this trouble in the first place. Between washes, a spray on disinfectant such as Marvicide or Lysol will kill most bacteria and fungus, and remove all foot odor at the same time, but may also leave a medicated, non-leathery smell that you do not enjoy. Isopropyl alcohol may release the adhesive that keeps the permanent insoles or parts of the lining in so while it cleans away bacteria, it should not be used to clean inside the shoe. Vinegar works, and kills fungus, but vinegar is also an unpleasant smell to most people, so leave the vinegar in the pantry and use an alternate method to stay fresh. Baking soda absorbs most odor but may not kill the bacteria which can resume emitting odor later. If you have black dress shoes and black socks, any white powders will be a mess anyway. Hand sanitizer will kill odor causing bacteria and you can wipe the insides of your shoes with it, but do not use too much because the main ingredient, ethyl alcohol, may cause insoles to become unglued, assuming that you have glued in insoles. So next time you sense that your shoes smell like more than just leather, do not put up with it. Wash them! Sunny Trailbringer is an anti-bacterial minister from the temple of No Pong and when she is not washing shoes she is hand-crafting leather accessories in Arizona. Its amazing to smell even open footwear like sandals start smelling very bad. What an excellent and detailed treatise on an important subject not often heard discussed! Shoes can come to smell worse than a dead skunk. Wow your post is very realistic and seems helpful for the people who got the problem of smell in their shoes and want to get rid of it. Hi, I just found this site with Google. Could you help me? Yesterday I bought a big can of coconut oil. Unfortunately the container was too weak, so when I lifted it, it broke and I spilled all the oil on the floor — and on my leather sandals 🙁 What should I do now? It has softened and darkened them a bit. Their smell hasn’t changed. What do you suggest? Should I try to wash them – and how? Throwing the sandals away is not an option as they are my favorites and cannot be bought any more. Sorry to hear you lost some great oil! But coconut oil is often used as a soap ingredient so it is harmless. Just wash your sandals in a bucket of cold water with your mildest soap, such as facial soap or shampoo, and the excess oil should come out harmlessly. They should dry in a couple of hours. No harm done. Do you know how to wash it in water? I see this product http://www.leather-clean.com Do you think it has merit? @Nick. Try it and let us know. 23 years of my experience as a dry cleaner has shown me through experiments that pure leather/leather shoes are not washable with water soluble chemicals, specially from the inside. Neither can they be dry washed in MTO or perclorethelyne , solvents commonly used to dry wash clothes. I’m designing a dry washing spray/foam to clean leather shoes. Let us hope for the best. Hi! Do you just rub the Clearisil on with a clean cloth? And, then rub with clean damp cloth to remove excess? I’m definitely going to try this!! No that would not be washing. The article says wash the shoes. The Face Wash is like a soap. Water is required. Thanks! Since some cleansers do not require additional water, I wasn’t sure. Rinse by saturating with water? I will have to try the face wash on some older leather brogue shoes that I have worn without socks. The shoes are all leather lined and need to be cleaned. Ok, I have found the low cut or no show socks to wear now in my newer footwear. Thank you, thank you, thank you for this much needed article!! I just washed my uber funky patent leather ballet flats with the Clearasil face wash and there’s no more sign of funk! I also did some research on footies to wear with them so they won’t get all funked up again and ended up buying SHEEC nylon no show socks from Amazon. They’re like 7 bucks a pair, but so worth the price. They stay put, are comfortable, keep my feet from getting all sweaty and stinky, and absolutely do not show at all. Total win. i lvoe it thnks!!! might use shampoo or dove soap since i feel silky when usingdove soap or shampoo…is this ok? Thanks, admin! It’s really helpful. ??? The Clearasil face wash did work. As Beth as stated, the no-show sock helps in keeping the leather clean. Also, it helps in controlling the sweat. Try using a bamboo activated charcoal sack … inside leather shoes that are Moccasin stlye .. for shoes or boots that have a midsole with a steel shank use a cedar shoe after drying them out with the charcoal sacks … company called Moso naturals makes these sacks for purifying ..
Suede shoes with road-salt lines and stubborn stains can be cleaned using white vinegar. You need to pour a little vinegar on a clean cloth and wipe off the affected areas with this cloth. It can be used on food stains, as well. Coming to grease stains, they are particularly difficult to remove. Nevertheless, you can try cleaning them with warm water. Plus, you could sprinkle cornstarch or talcum powder on the oil stain and leave it overnight. Next day, brush off the powder lightly and moisten the stain slightly with a steam iron. Finally, try to remove the stain using your suede cleaning brush. For ink stains, you may apply a cotton ball soaked in rubbing alcohol. If the stain is fresh, try to scrub it away with fine grit sandpaper. Suede eraser, too, can prove to be useful in this regard. In cases where chewing gum or wax is stuck on suede shoes, you may have to freeze the shoe for a few hours. This shall help the gum or wax harden on the surface, thereby making it easier to chip them off with a nail brush.